On 09/06/2014 P.P. 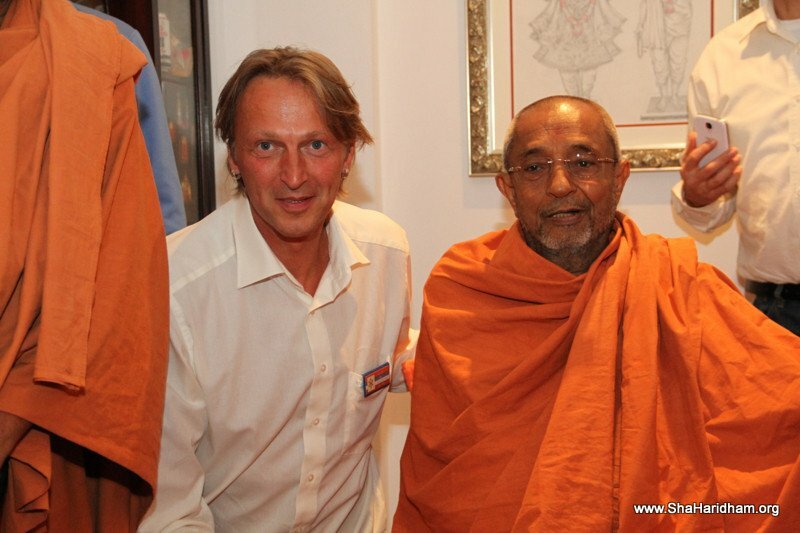 Swamiji came to Mumbai via Vadodara at 11.30 p.m.. On 10-06-2014 He came to airport for going to Zurich from Mumbai. Even the most beautiful ultra modern newly constructed airport of Mumbai also looked tasteless before the flow of disciplined gathering of Youths and devotees dressed in cream colored upper dress. Along with all the devotees of Ghanshyam Pradesh, even the executives of airport authority obtained the blessings of P.P. 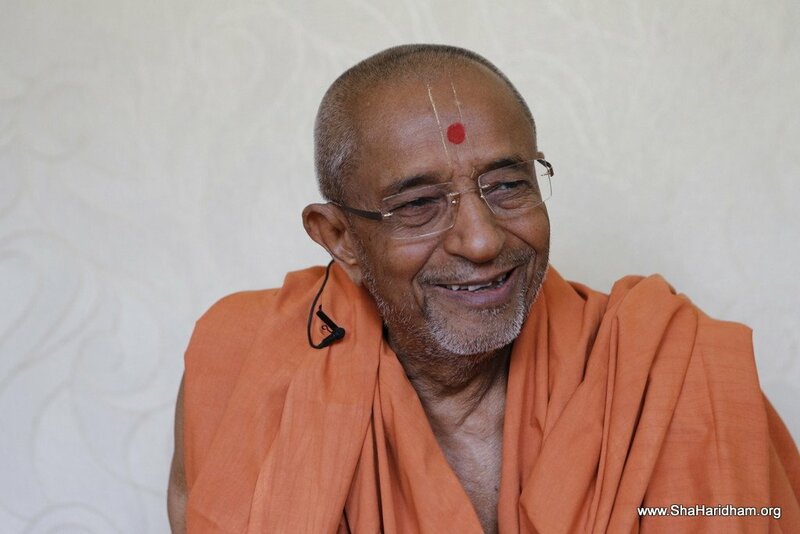 Swamiji. Immediately on occupying His seat in the flight P.P. Swamiji asked for “ PURUSHOTTAM BOLYA PRITE “ and started reading it. 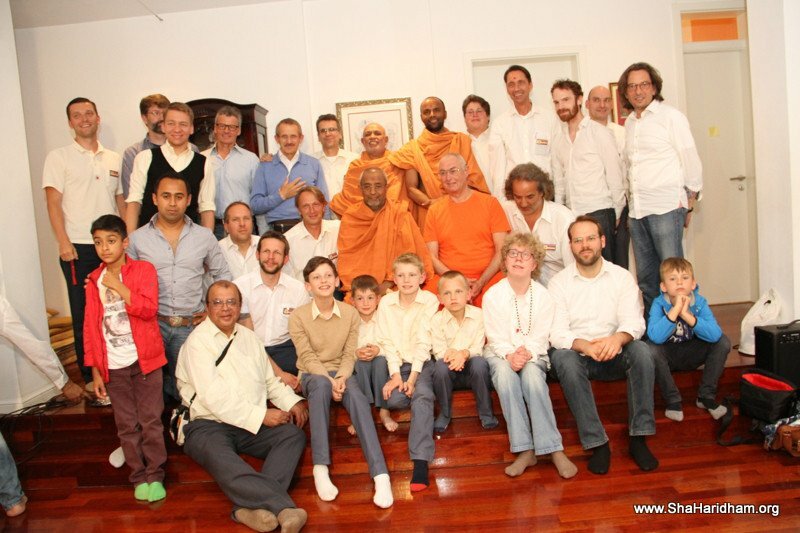 Landing on Zurich airport at 7.30 a.m. on 11/06/2014 devotees of Zurich Mandal welcomed P.P. 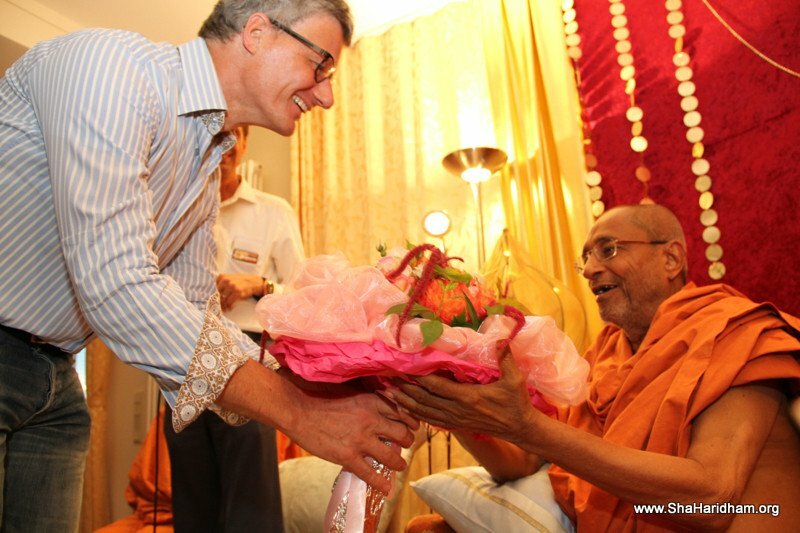 Swamiji with flower bouquet and all got benefited by darshan, talks, memories of P.P. 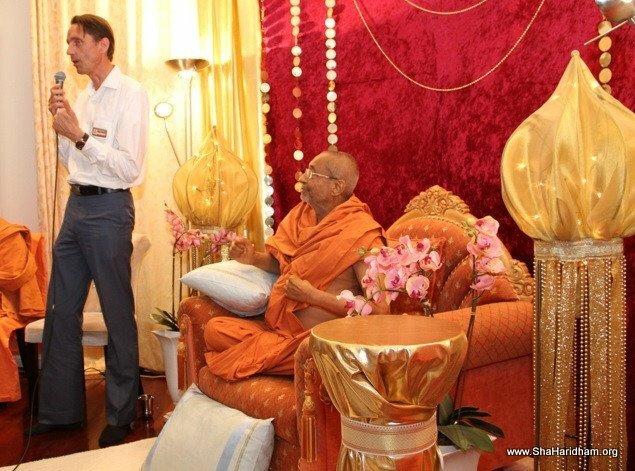 Swamiji during His 3 days’ stay there. On 13/06/2014 night P.P. Swamiji came to Berlin – Germany from Zurich. 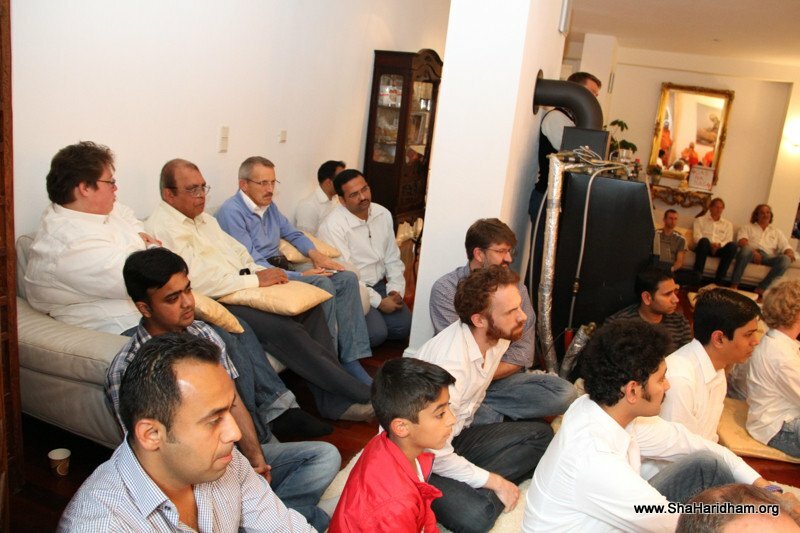 The devotees of Berlin were very happy to receive P.P. Swamiji and could not control their joy on the occasion. 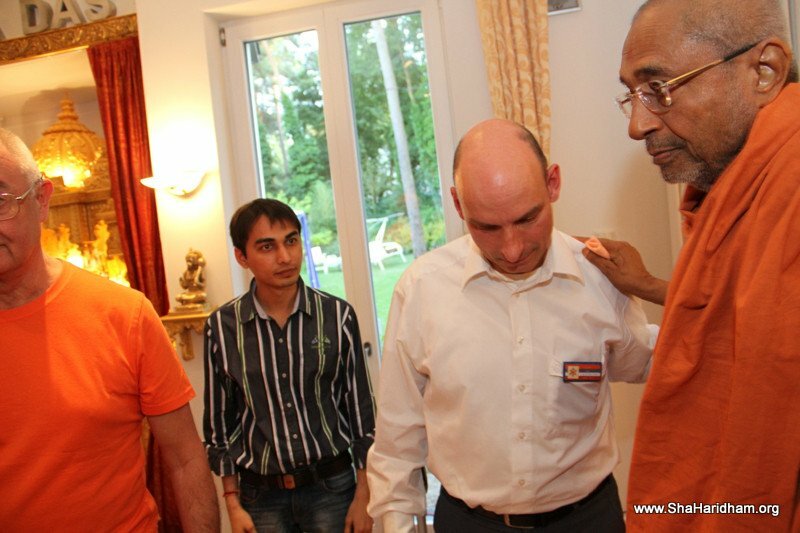 P. Brahmvihari Swami and P. Sanatan Swami had reached Zurich 2 days in advance and along with them the devotees of German Mandal welcomed Thakorji, P.P. Swamiji and the accompanying saints. Here, during 13th to 24th June, P.P. 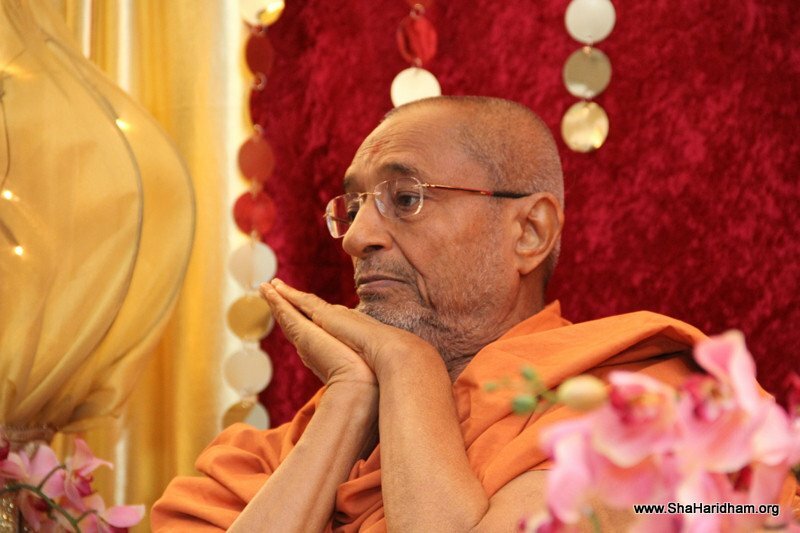 Swamiji remained fully occupied with general and personal talks with devotees, reading letters from and writing letters to devotees, receiving phones from and making phones to devotees along with giving darshan to devotees, reading and listening and watching the videos of other saints. 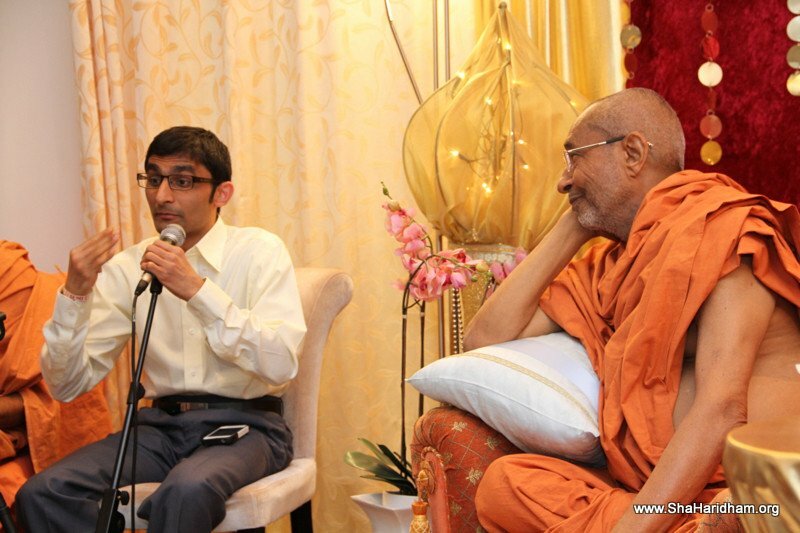 All those, like Divyangbhai from America, Satishbhai Chatvani and Chirag Bhai from London, Bitulbhai from Naroda (Ahmedabad) who came specially to benefit out of P.P Swamiji’s company also wondered at the status of ATMIYATA of these Muktas and said, “ WE CAN REALLY NOT FIND ANY SUCH A GROUP / MANDAL anywhere else on earth. ” And, that is only why, P.P. Swamiji also expressed his happiness for this mandal and said that the Berlin Mandal really deserves first rank in ATMIYATA. Nyfylqf õhpduîu sp.9/6/2014“p fp¡S> kp„S>¡ lqf^pd’u hX$p¡v$fp ’C dy„bC ‘^pep®. sp. 10 S|>““p fpÓ¡ 11:30 hpÁe¡ dy„bC’u ÄeyqfL$ S>hp A¡f‘p¡V®$ ‘f ‘^pep®. “e“fçe “|s“ V$rd®“g ‘Z ¾$udL$gf“p X²¡$k’u riõsbÙ kˆ> eyhL$p¡-c¼sp¡“u d¡v$“u’u Tp„My„ ‘X$u Ne„y lp¡e s¡h„y gpNsy„ lsy„. O“íepdâv$¡i-dy„bC“p hX$ugp¡ A“¡ A¡f‘p¡V®$$“p Ar^L$pfuAp¡A¡ ‘Z õhpduîu“p Aprij âpá L$ep®. ãgpCV$dp„ b¡ksp“u kp’¡ S> lp’dp„ "‘yfyjp¡Ñd bp¡ëep âus¡' gC s¡“y„ hp„Q“ iê$ L$ey¯. sp.11/6/2014“p fp¡S> khpf¡ 7:30 hpÁe¡ ÄeyqfL$ A¡f‘p¡V®$ Dsep®. ÄeyqfL$d„X$m“p c¼sp¡A¡ õhpduîu“y„ ‘yó‘NyÃR>’u õhpNs L$ey¯. ÓZ qv$hk“p fp¡L$pZ v$fçep“ klº c¼sp¡“¡ v$i®“-Np¡r›$-õd©rs“y„ cp’y„ b„^pìe„y. sp.13/6/2014“p fp¡S> fpÓ¡ ÄeyqfL$’u brg®“-S>d®“u ‘^pep®. brg®““p c¼sp¡“p l¥e¡ õhpduîu“p ApNd““p¡ Ap“„v$ kdpsp¡ Þlp¡sp¡. ‘|. b°ûrhlpfuõhpdu, ‘|. k“ps“õhpdu b¡ qv$hk ANpD’u Al] ‘^pfu Nep lsp. s¡d“u kp’¡ S>d®“ d„X$m“p c¼sp¡A¡ îuW$pL$p¡fÆ, Nyfylqf õhpduîu A“¡ k„sp¡“y„ ‘yó‘lpf s’p byL¡$ A‘®Z L$fu cphcu“y„ õhpNs L$ey¯. sp. 13 ’u 24 S|>“ v$fçep“ õhpduîuA¡ Al] flu c¼sp¡“u c[¼s“¡ õhuL$pfu. v$ffp¡S> Np¡[óW$Ap¡, Mp“NuAp¡, c¼sp¡“p ‘Óp¡“y„ hp„Q“, ‘Óg¡M“ A“¡ ap¡“ ‘f c¼sp¡“¡ v$i®““u kp’p¡kp’ r“f„sf hp„Q“, k„sp¡“p âhQ“p¡“y„ huX$uAp¡ v$i®“ L$ey¯.